Like most people, my relationship to possessions is predicated on money. 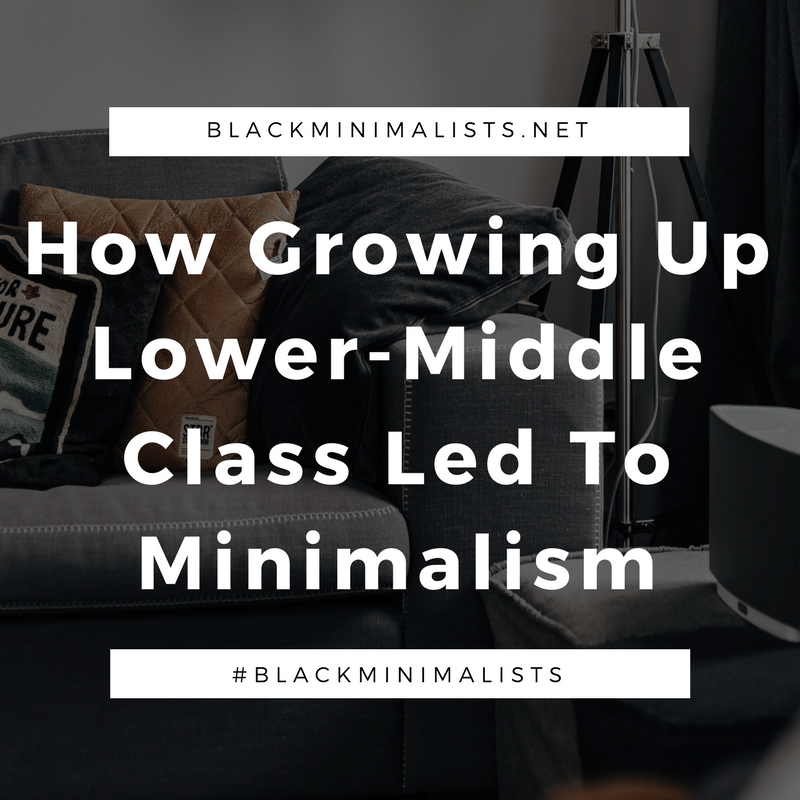 I grew up knowing that my family wasn’t exactly well off, but I assumed we were better off than we actually were because of how we were able to acquire or maintain our possessions. However, there were still times where I would hear, “No,” and my parents would explain to me that they weren’t able to afford something I wanted. In time I understood what my possessions (particularly clothes) signified to me and realized it was possible to find other outlets for my emotional needs and wants besides buying things. My adoption of minimalism comes from this reconsideration of clothing, and taking the time to consider my own desires. If I had to label my family’s class status, I would probably put us somewhere in the realm of lower-middle class. Many factors play into that label beyond income, such as geography and education, and I want to take time to express that before delving further. In many ways, this is a conversation about disposable income. My basic needs were met throughout my childhood; however, many strings were being pulled behind the scenes to ensure my comfort. There were times of seeming abundance during my childhood. Those usually came around holidays or during tax season. That’s when I would get new clothes or other things that I had been pining for. I realize now as an adult that money and personal possessions signified resources, stability, and comfort. I’ll never forget the moment when I was eleven years old and in the midst of puberty. I asked my mom for new jeans because I only had three pairs that fit. My dad on the other hand, took it to mean I only had three pairs that I liked. As an adult I understand, I ironically have three pairs of jeans by choice because I didn’t need more than that. But at eleven, I felt like I couldn’t rely on my parents discretion because they had to tell me, “No”. As a kid, I tried to acquire as much clothing as possible (nomatter the quality) to show I was living in abundance and comfort. Then as a teen and into my college years, I wanted the best quality clothing so that I could blend in with my peers. One of my therapists during this time said, “You know, I wouldn’t have realized you didn’t have money unless you said it. Not that poor people look a certain way. It’s just – you’re very put together.” Needless to say, a fumble on her part, but that moment symbolized exactly how I used well-made clothes to navigate social settings. Throughout my first two and a half years of college, I used whatever money I earned to shop at Goodwill, the sale section of Gap, or whatever place I could get good quality clothing. By my junior year I looked around and realized the sheer amount of crap I had. I was finally pushing the five-figure mark in terms of my own income, but most of my money felt disposable because I was spending it all on clothing. My reliance on having things even outweighed my personal style – most of the clothes I had didn’t match the vision I had for how I wanted to dress. And so I decided to pursue minimalism. For me, minimalism offers a way to reconsider the significance of clothing. While it might mark stability and comfort, owning an excessive amount of it doesn’t somehow maximize those two things. I had a lot of things simply because it felt good to have them. Reassessing my wardrobe did more than reduce my number of clothing items. In giving away two-thirds of my clothes, I had to create a budget to guarantee that all of my money wasn’t going to clothing. Most importantly, I had to address the root causes behind why I felt the need to shop, what I thought clothes meant to me at the time, and finding ways to feel secure that didn’t involve spending money. Growing up, my family’s collective and accepted love language was gift giving. And when it came to self-love, I saw folks buying themselves things. The satisfaction had to come from things that could be treasured and stored, not experiences. Self-care and shopping were one in the same. Now, for me shopping is a source of instant gratification. I see something I like and I want it. There isn’t a drawn out process. However, because of minimalism I am trying to be more reflective before I purchase something. I ask myself: Am I buying this to fill a wardrobe need? Or is this something more deeply rooted in emotion? As I mentioned before, clothes also offered me a way to pass for something other than what I was. I refused to wear purposely ripped or stained clothing because I wanted to fit what I thought was presentable. As a teen, I wanted to be a fashion journalist, and so clothing was a form of self-expression and was aspirational for me. But I’ve realized, I sometimes need to think of clothes in the most utilitarian way as possible. Do I need five white tees? Do I wear jeans enough to warrant more than my three pairs? Because of my childhood, clothes and shopping just feel good. Despite feeling tinges of guilt while spending, having new clothes makes me feel secure and stable. I am actively working on changing this mindset, and viewing clothes as a necessity. And I am learning to have fun experimenting with different styles using the clothes I already have rather than use shopping as an outlet. My relationship with objects is one-in-the-same as my relationship to money, but luckily I am trying to remedy both.